OMAHA, Neb. (CNS) — After six months together at the St. John Paul II Newman Center in Omaha, residents — and nonresidents — are creating bonds based on friendship, sharing and faith. The center, which opened in August 2016 near the University of Nebraska at Omaha campus, is the dormitory home to more than 100 students from the university and the College of St. Mary. And they’re more than dorm-mates bound together by academic, athletic and social pursuits — they’re a faith community engaging with each other on a deeper level of faith and prayer. 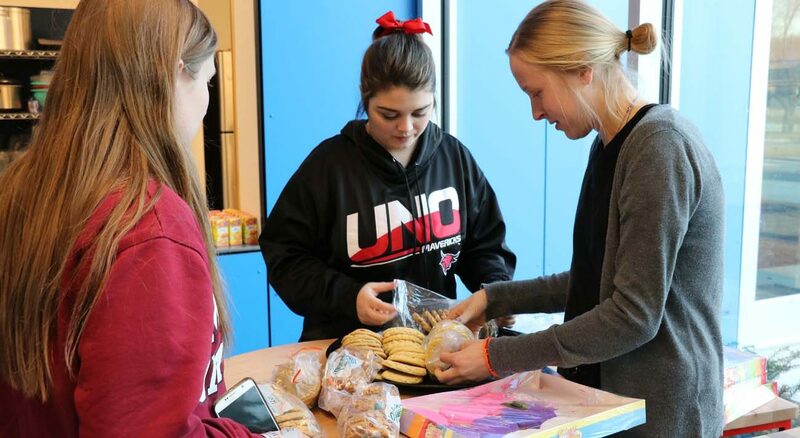 “The opportunities here are so different than living in Scott or University Village, with the opportunities for daily Mass or adoration,” said Michaela Moriarity, a UNO freshman and member of St. Elizabeth Ann Seton Parish in Omaha. Informal or student-planned activities also bring students together, said Cole Nardini, a UNO senior and member of St. Pius X Parish in Omaha, who started a men’s night — often for bowling or conversation. “But the number one thing for me is to be able to hang out in our study spaces, to say ‘hi’ to people and start up some card games — just being available to people — it’s irreplaceable,” Nardini told the Catholic Voice, newspaper of the Omaha Archdiocese. “There are a lot of open areas where students can engage, and nonresidents can also find a place to study, join our community and participate in activities like Thursday night Mass and community night,” he said. Katie Winkler, coordinator of college apostolates for the Omaha Archdiocese, said the opportunity for Catholic students to live together helps them get to know one another, and support and challenge each other in their faith. Haley Eschbacher, a College of St. Mary junior from St. Louis, said the sense of community helps her “feel really alive.” One of several St. Mary students living at the Newman Center, Eschbacher said she feels welcome, enjoys participating in some UNO campus activities and leads a Bible study at the center. Recent faith- and community-building activities away from the Newman Center included a retreat in South Dakota this past October, and in January a SEEK conference sponsored by the Fellowship of Catholic University Students in San Antonio and the March for Life in Washington. Upcoming events include a Spiritual Impact Bootcamp retreat in David City in February, and two spring break mission trips — one led by FOCUS missionaries, and a Newman Center-sponsored trip to Denver to work with Christ in the City missionaries serving the poor.